Posted July 23rd, 2012 by Yvonne Hawkey & filed under Epos, Loudspeakers. A musical treat and a serious piece of speaker engineering, the Epic 5 sets the standard for floorstanding speakers at anywhere near its price point. 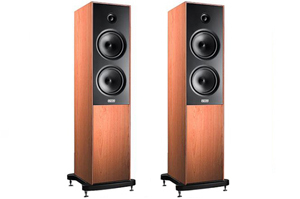 The 5â€™s can be put on the end of some very high quality systems and donâ€™t look out of place, this really is the doorway to truly great musical performance. Weâ€™ve been blown away by how good these speakers can be in the right environment, and they combine with our five favourite â€˜affordableâ€™ amplifiers (the Nait XS, Rega Elicit, Moon 250i, Lavardin IS and Leben 300) to produce systems that make many so called â€˜high endâ€™ set-ups sound positively laughable.